The beauty of wood or stone and the ease of vinyl make laminate flooring the perfect choice for busy lifestyles. Laminate can be installed over most existing floors with minimum effort. Laminate is ready for your busy lifestyle. These floors are easy to maintain, durable and look wonderful in your home. They are stain-resistant and very easy to maintain. Laminate is a very good choice if you are on a budget. With a 20-year fade warranty, you can change out the rooms in your home overtime and the flooring will still match. Here at Howland Floor Covering in Richland, MI, we have many styles, patterns, and colors to choose from. We carry Formica, Casabella, and Armstrong to fit your own unique personal taste. Vinyl flooring is an excellent flooring choice for kitchens, laundry rooms, and bathrooms where moisture is present. Vinyl flooring can create a three-dimensional texture that looks and feels like natural wood, stone, slate and tile. Vinyl flooring has no crevices or cracks were moisture and dirt can collect. Vinyl is easy to clean and resist stains better than most other floors. Vinyl flooring comes in different grades of gloss. For high activity areas, a low to medium vinyl floor is recommended. 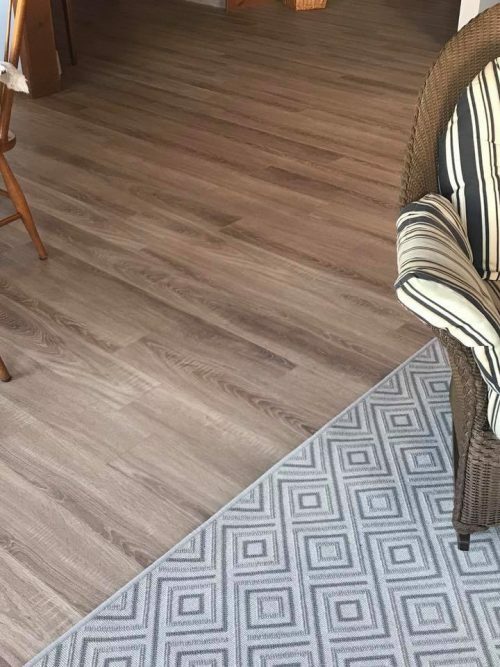 Here at Howland Floor Covering, we carry the brand names of Viking, IVC Floors, Metro Floor, Inspiria, and Armstrong to ensure you an array of dynamic, luxury vinyl flooring in many styles, colors, and patterns. This helps you create a look and feel of your own. We’re happy to stop by your home and provide an estimate! For all of your flooring, tile, and countertop needs, rely on the professionals at Howland Floor Covering.